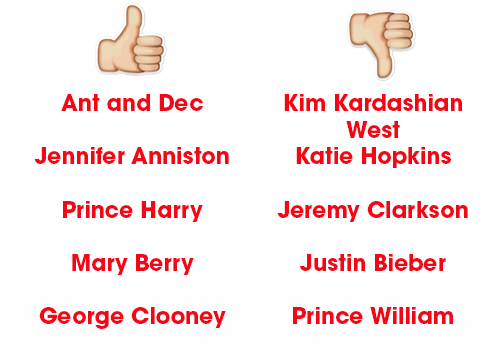 This poll uncovered who Brits feel would make the best celebs to work with and the worst! In a recent poll, 1,000 Brits were asked which celebrity they would most like to share a flat with. The poll, ran by sofa and carpet store, ScS came out with a list of the top five celebs people would love as room mates...and the worst five. Looks like people would most like beloved Geordie duo Ant and Dec to live with them. The pair actually already live pretty near to each other, on the same road in Chiswick, London in fact! And apparently, people seem to think Kim Kardashian West would make the WORST room mate as 66% said she would be too loud to live with. Jeremy Clarkson came third in the list of the worst because 44% thought he might hog the remote control which watching TV and poor Prince William came in the list of bad room mates too because 27% thought he would be 'too introvert', even though his bro made it into the top five.